The clear implication is that the NP needs to consult with a physician. In reality, NPs are adept at using skilled assessments and patient education to manage chronic health issues without any particular need for physician consultation. Of course, just as physicians consult other physicians, NPs consult physicians when necessary. 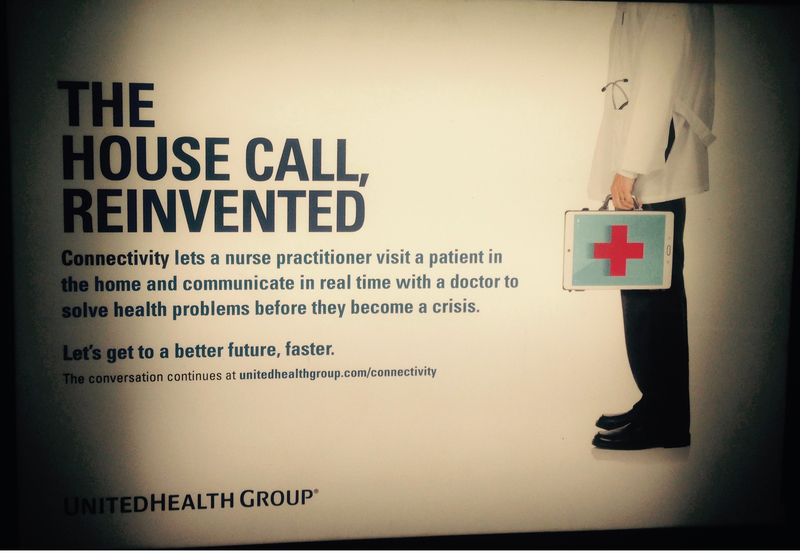 In mid-2015 UnitedHealth’s online description of its HouseCalls program said it “enables doctors and nurse practitioners not just to visit seniors at home but to be connected securely to the health system with their medical history,” and after the visit, “assessments and insights are sent in real-time to the primary care physician.” That still wrongly indicates that patients need a primary care physician, but at least it does not suggest that NPs are just the “eyes and ears” of physicians; the NPs may even have “assessments and insights” to share! In fact, as far as we can tell from the company’s online description of the HouseCalls program, the NPs are the key players: A more detailed discussion available at that time did not mention physicians at all. 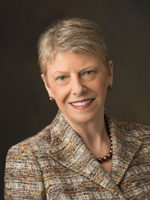 UnitedHealth, whose annual revenues exceed $100 billion, has a nurse among its top leaders, executive vice president Jeannine Rivet, RN, BSN, MPH, FAAN (although you would not know she was a nurse from the company website’s “Executives” profile). 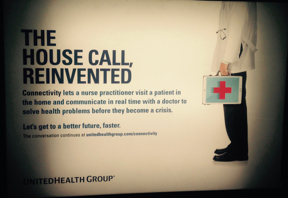 So it appears that company leadership knows that nurses can and do play critical roles in health care. 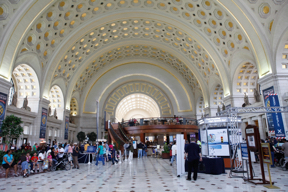 We urge them to ensure that UnitedHealth advertising reflects that understanding in the future. Connectivity lets a nurse practitioner visit a patient in the home and communicate in real time with a doctor to solve health problems before they become a crisis. Let’s get to a better future, faster. CONNECTIVITY IS ALREADY ENABLING US TO REINVENT THE HOUSE CALL. Our HouseCalls program enables doctors and nurse practitioners not just to visit seniors at home but to be connected securely to the health system with their medical history. After the visit, the assessments and insights are sent in real-time to the primary care physician. The result: illnesses are identified sooner and patients get treatment earlier. Evidence shows that HouseCalls reduce hospital admissions by 9% and readmissions by 28%, and increase doctor office visits by 7%. And we know it’s only the beginning of what’s possible. Connectivity can provide all Medicare beneficiaries, especially high-risk patients with the most complex, chronic conditions, access to proven technology-enabled health care in their homes and other non-traditional settings so they can receive better-coordinated care and around the clock support. HouseCalls combines the human touch of in-home medical examination with sophisticated technology and targeted health education to improve the health and quality of life for seniors. Educate individuals on care for chronic conditions. By examining individuals in their homes, Optum collects critical insight unavailable outside the HouseCalls program. Using the XLCare technology support system, nurse practitioners access relevant clinical data and transfer assessment data in real-time through tablet computers. With this combination of unique information and hands-on care, nurse practitioners can build a strong foundation of trust, create stronger adherence to physicians’ orders and prescriptions, and craft a plan of customized care for each individual that can be shared electronically with their care providers. Um…what happened to the physicians? It certainly seems like the “deeper” you get into how the program actually works—and how it can achieve such impressive results—the more it appears to be mainly about skilled, autonomous nurses doing what they have always done: providing critical assessments, care coordination, and patient education with a focus on prevention and wellness. (We see the bit about “physicians’ orders,” a regressive misnomer that should be replaced with “care plans” or “prescriptions.”) So we wish UnitedHealth’s subway posters directed at the general public likewise reflected the centrality and autonomy of the NP role. Research shows that NP care is at least as effective as physician care, and NPs excel at the kind of home care involved here, as the website itself suggests. But it’s common for the real importance of nursing to be conveyed only in messages directed at nurses themselves or other health insiders. More importantly, we hope that in the future UnitedHealth will publicly honor the NPs who are evidently enabling it to improve care (and of course, its profits) by not wrongly suggesting that NPs can only solve health problems by consulting with physicians. Messages of nursing strength and autonomy should not appear only on nursing recruitment pages or other places where only insiders are likely to go. 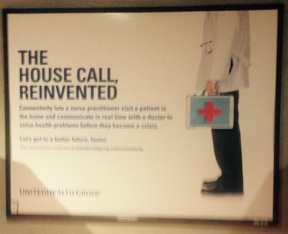 These messages can and should be at the forefront of UnitedHealth’s marketing. Such an approach might even improve “connectivity” and help us get to a better future, faster. Please contact UnitedHealthcare’s public relations official, Lynne High, at 1-952-979-5861 or lynne_m_high@uhc.com and ask the company to highlight, not mask, the abilities and talents of its nurses. Thank you!